In honor of Mother's Day, we invited the Italian American Girl readers to submit their favorite story about their Italian -Italian American mother. Here are a few of the most touching stories. I love cupcakes and I think this goes back to my childhood and the horrible lack of cupcake goodness throughout most of it. Growing up in a First Generation Italian home cupcakes were not really my Mom's forte: why make silly old cupcakes when you can make homemade Cannoli, Biscotti, and French Candies? But I always had a deep longing for those oh so simple yet oh so good All-American cupcakes, and here's why: 1) The size, you get your very own cake! 2) They are portable each having their own carrying case. 3) They are so adorable! 4) Easy to serve, no cutting. 5)Fun to decorate making each and everyone unique if you desire to do so. I guess these All-American treats are a lot like us as Americans: Carefree, Individual, and quite Adorable! 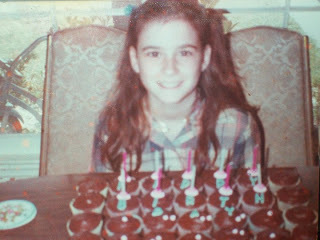 I do have to confess though that my Mom did give in and made me chocolate cupcakes for my 10th birthday, as you can see in the photo below. Although I am sure the very idea of making cupcakes seemed rather silly to such an experienced baker and pastry maker, she could whip out 100 homemade cannoli shells in an afternoon and made 100's of homemade candies and cookies every Christmas, my Mom humbled herself and baked me regular old chocolate cupcakes. And many years later I finally understood my mother's struggle to give in to such a simple request when on my daughter's birthday I asked her what "special foods" I could make her for her birthday meal and she all too quickly responded, "Frozen tater-tots and pop-tarts!" 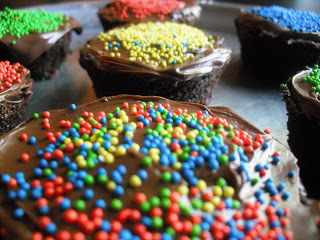 This recipe is a nod to my Italian American roots: Hershey Cupcakes with Nutella frosting! Line 2 cupcake trays with cupcake liners and spray each with some vegetable spray. Mix all the dry ingredients together, including the sugar. Add the milk, eggs, vanilla, and butter and mix for 2 minutes on low with a mixer. Add the boiling water and stir just until combined. Using a 1/4 cup measuring cup or ice-cream scoop fill each cup 2/3 full with the batter. Bake for 22-25 minutes. Cool trays on racks for 5 minutes. Run a knife around edges if any seem to be stuck to the pan. Flip over on to rack, bang bottom and release onto tray, flip each cupcake over and cool completely. Note: This recipe make about 30 cupcakes but I find that if you let the batter sit and wait for the first batch to bake and cool they do not bake as well so I usually just make 24 using my 2 (1 dozen) trays at once on the same oven rack and throw out the rest. Leave these cupcakes out on a counter and covered as they do not refrigerate well.